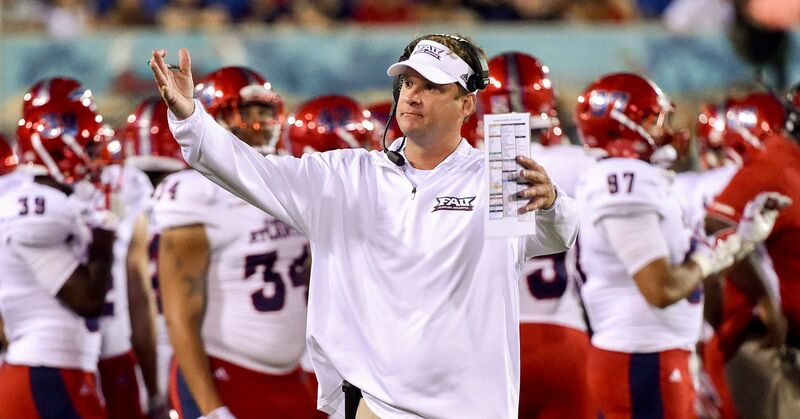 At the outset, we didn’t see what was coming with Lane Kiffin’s Florida Atlantic (2017 SUR 11-3; PSR 10-4; O/U 6-8) last fall, but by early October had jumped on board what would become a nice gravy train with the Owls that continued thru a C-USA title game romp past North Texas and a 50-3 blowout of poor, overmatched Akron on FAU’s home field in the Boca Raton Bowl. Along the way the snarky coach revved up his offense to one of the most potent in the land (40.8 ppg ranked eighth) and rehabbed his professional rep that took its latest hit when running afoul of none other than Nick Saban during the playoffs with Bama in 2016. But last year, at least, Kiffin had the last laugh, and gleefully ran up scores as the campaign progressed, dropping such bombs as 58 points (vs. MTSU), 69 (vs. North Texas before laying another 41 on the Mean Green in the C-USA title tilt), 52 (in the Shula Bowl vs. local rival FIU), then the aforementioned 50 vs. the zip-less Zips in the bowl. After an unbeaten league run, and many lopsided wins, you can imagine many C-USA entries will relish the chance at payback. But Kiffin, a client of super agent Jimmy Sexton, could prove an elusive target, as he is effectively a year-to-year proposition in Boca Raton, and could soon get another Power 5 chance if he keeps winning big as in 2017. Some of the mechanism will have a different look in 2018 after both of Kiffin’s coordinators (o.c. Kendal Briles to Houston and d.c. brother Chris to the NFL 49ers) moved up the pay scale in the offseason. Not afraid to roll the dice, Kiffin has inked 24-year-old Charlie Weis, Jr., who served with Kiffin at Bama, to take the place of Briles. (Imagine being stuck in an elevator with Weis, Jr.’s dad and Kiffin!) Though the ferociously up-tempo offense will remain mostly the design of Kiffin, still the play-caller. Kiffin needs a new QB after Jason Driskel, who emerged as a more-than-serviceable pilot last fall, decided to retire from the game; a couple of transfers, ex-Florida State De’Andre Johnson (who saw limited work for the Owls LY before blood clot issues in his arm) and ex-Oklahoma Chris Robison, will likely continue their battle into fall camp. But both were touted preps who could eventually prove an upgrade at the position. They can lean on a bellcow RB, Devin Singletary, who blasted for a nation’s best 1920 YR and 32 TDs last fall and enters 2018 as a darkhorse Heisman candidate. Kiffin’s fast-paced offense, borrowing a page from Kiffin mentor Norm Chow's use of Reggie Bush as USC, was able to constantly spring Singletary on passing downs in downhill situations against spread-out defenses. Meanwhile, West Virginia transfer WR Jovon Durante and all-name juco Nero Nelson, along with LY’s C-USA All-Frosh Willie Wright (56 catches LY), should provide dangerous downfield targets. The interior of the OL does need a quick rebuild, though Tulane grad transfer C Junior Diaz eases some of those concerns. To replace his brother as the defensive play-caller, Kiffin raided the West half of C-USA by stealing away Tony Pecoraro from Jay Hopson’s Southern Miss staff (note the Golden Eagles are not on the Owls’ 2018 slate, unless they meet in the C-USA title game). FAU stuck mostly with conventional 4-2-5 looks for C. Kiffin last fall, though Pecoraro has been more apt to disguise formations and blitz frequently in the past. Pecoraro might be tempted to gamble some more with ten starters back in the fold, paced by a pass defense that recorded a whopping 20 picks, tied for second nationally. Playmakers abound, with LB Azaaz Al-Shamir, CB Shelton Lewis, and SS Jalen Young each an All-C-USA honoree last fall, and sources say Pecoraro’s schemes were absorbed seamlessly in spring. One of the fascinating games of opening weekend will see Kiffin take a shot at post-Baker Mayfield Oklahoma at Norman; the oddsmakers pegged the Sooners a 3-TD favorite early in the summer, but afterward there was no stampede of OU money to the sports book windows in Las Vegas. Following will be a tricky assignment vs. Air Force in Boca Raton, and two weeks later a trip to UCF, which was undefeated last season. Considering the personnel and staff changes, the tough early slate likely removes FAU from consideration for a New Year’s Six bowl, but we would not bet against Kiffin running up more scores before the end of the season and successfully defending his C-USA crown. Spread-wise, as noted, Kiffin was also a force last season, covering 10 of 14, even while gifting Marshall a spread W when running backwards to take a safety in the last seconds of their Nov. 3 meeting, causing quite a ruckus in the Las Vegas sports books! That was the only one of the last seven at home in 2017 that FAU didn’t cover, and Kiffin was usually worth the risk as heavy chalk, covering 4 of 5 laying double digits. Well, we admit that we missed the mark last summer with Marshall (2017 SUR 8-5; PSR 9-4; O/U 7-6), as we projected the Herd to continue with the myriad problems that submerged the program to 3-9 in 2016, when the bottom almost dropped out amid rumors of internal strife. But we had changed our tune by the end of September when Marshall had recovered and was en route to a quick 6-1 break from the gate before hitting a few speed bumps in the second half of the schedule. Nonetheless, it proved a recovery of note for HC Doc Holliday, and dismissed worries that his noted recruiting pipeline into Florida and SEC territory had dried up. So much for that; among his top ten recruits for this season, nine hail from SEC states, and four from Florida, so all still seems in order for the Doc, who enters his ninth season at Huntington full of confidence after an exciting 31-28 New Mexico Bowl win over Colorado State. Hardscrabble QB Chase Litton, the source of some of the internal disruptions in 2016 but having recovered a year ago to complete his Herd career with 73 TDP, is now gone and spending summer in the Kansas City Chiefs camp (after declaring, perhaps mistakenly, for the NFL draft in which he was not selected). But plenty remains for Doc and new o.c. Tim Cramsey, a former o.c. at Nevada who was hired off of the Sam Houston staff after the potent Bearkats reached the FCS semis last season. Almost 95% of the rushing yards and 80% of the receiving yards are back in tow from 2017, not to mention all five starters returning on the OL. Obviously not afraid to skim the cream of the FCS crop, Holliday will likely be going with grad transfer Alex Thomson, from Bob Beckel’s alma mater Wagner, at QB. Thomson, who missed most of last season with injury, passed for almost 2500 yards in 2016 and will work behind the aforementioned OL that ranked 4th nationally in fewest sacks last fall. Among the many established weapons are sr. WR Tyre Brady, who caught 62 passes and 8 TDs in 2017, and the slashing RB tandem of Tyler King and Keion Davis, a two-headed monster that rolled up a combined 1632 YR and 13 TDs last fall. What might have been the best “D" in the Holliday tenure at Huntington returns almost en masse from the 2017 platoon that allowed only 19.9 ppg to rank 17th in scoring defense, quite an achievement in a whip-the-ball-around-the-yard league like C-USA. Nine starters are back in the fold, including the entirety of a disruptive DL that now includes former OLB Juwon Young, who has moved to DE to help add more pressure from the edge. Prompting that move is the return of sr. OLB Donyae Moody, who was a starter earlier in his career before an ACL tear last season, but now back in the mix alongside MLB Chase Hancock, a destroyer who notched 128 tackles and 9.5 TFLs in 2017. Soph S Brandon Drayton looks a star-to-be in the secondary, though the Herd exited spring with some depth issues in the defensive backfield. Schemes don’t figure to change much with new d.c. Adam Fuller, promoted from LB coach where he served under the sage Chuck Heater, a Bo Schembechler disciple who has moved to a similar post at Maryland. Marshall is always glad to step up and take a few swings at the big boys when it has a chance in pre-league play, and will take its best shots vs. bowl-caliber Power 5 foes South Carolina and NC State (which travels to Huntington) in September. Already, however, anticipation is building for a likely C-USA East showdown vs. Lane Kiffin’s FAU at Joan Edwards Stadium on October 28. Unless things completely unravel as they did in 2016, the Herd figures to be in the race all of the way in the East and qualify for a bowl for the 6th time in 8 seasons. Spread-wise, last year was also a recovery for Doc, who covered 9 of 13, including 6 of 7 away from Huntington and all five chances as an underdog. Should Marshall make it to a bowl, note a 6-game win and cover streak in the postseason (5-0 for Holliday) that extends back to the 2009 Little Caesars Bowl, when interim Rick Minter was at the controls afer Mark Snyder’s dismissal. Do you mean he’s still got eligibility? We’re talking about Middle Tennessee (2017 SUR 7-6; PSR 6-7; O/U 5-8) QB Brent Stockstill, who seems like he’s been around Murfreesboro as long as his dad Rick (entering his 13th season) has been head coach of the Blue Raiders. But southpaw Brent, who threw his first MTSU passes in 2014, not 2004 as it sometimes seems, indeed has another year to go as a redshirt senior. His importance to the MTSU cause cannot be understated, as the Blue Raiders looked destined to miss a bowl for the first time in three years when Stockstill was sidelined for six games thru midseason in 2017 due to a cracked sternum and collarbone injury suffered late in a 30-23 win at Minnesota. By the time Stockstill got back on the field on November 4 vs. UTEP, MTSU needed to win three of four to gain bowl eligibility. Which the Blue Raiders did before finishing the season on a high note with a win over Arkansas State in the Camellia Bowl, breaking a 4-game losing streak in the postseason for Brent’s papa Rick. As long as Brent (with 77 TDP and only 24 picks in his career to date) is on the field, MTSU figures to have a puncher’s chance, but keeping him healthy might be easier said than done after the coach’s son has missed nine games due to injury the past two seasons. He will be proceeding minus favorite target WR Richie James (who decided to skip his senior year and was drafted by the 49ers in April), who was another injury casualty last season and missed several games after catching more than 200 passes the previous two years. With James sidelined much of last fall, now-jr. Ty Lee (79 catches in 2017) emerged as the top target, while speedy RS frosh slot Zach Dobson opened some eyes in spring. Three starters are back along an OL that left spring with depth issues and can ill afford to subject their valued QB to more hits. Injuries also depleted the RB corps LY with explosive soph Brad Anderson missing a handful of starts, which allowed 245-lb. former LB Tavares Thomas (507 YR) to briefly shine late in the season after he, too, had been sidelined. If healthy, Thomas (a legit downhill threat) and Anderson provide a nice thunder and lightning combo, but like thoroughbreds, injuries are often a recurring theme, and the elder Stockstill and his spread maven o.c., Tony Franklin, are hoping all hands are on deck more than not in fall. The “D” also dealt with a spate of injuries last term, though all things considered mostly held up its end of the bargain in 2017 and in fact led C-USA in tackles for loss. Not pushing things in spring, HC Stockstill and d.c. Scott Shafer (a former Syracuse HC) kept key cogs S Jovante Moffatt (leading MTSU tackler LY with 101 stops) and former Mizzou transfer DE Walter Brady on the sidelines to rehab injuries, though promising soph DT Ty Nix went down in March. On the plus side, DE Jahmal Jones was granted a sixth year of eligibility, and some key playmakers return, including disruptive OLB Kahlil Brooks (17 TFLs last fall) and three starters in the secondary. Shafer’s arrival on the staff last year also coincided with improvements from 2016 on the stop end. As usual, MTSU has a string of challenging non-conference dates, and will play as many true SEC road games (at Vandy, Georgia, and Kentucky) as Arkansas. Contention in C-USA East likely relies upon back-to-back games at home vs. Lane Kiffin’s FAU and at Marshall just before midseason. If QB Stockstill hasn’t gotten hurt by then, the Blue Raiders (who lost to the Owls and Herd minus Brent in 2017) might have a chance. Nonetheless, another minor bowl should be expected in Murfreesboro. Spread-wise, the one situation that has worked well for HC Stockstill in recent years has been as a double-digit favorite; the Blue Raiders are 9-3 in such roles the past three seasons, and given the C-USA schedule, should have at least a few chances to better that mark this fall. While Nancy Lieberman (sorry, Kent Bazemore!) might still be the most identifiable sports alum, and basketball (mostly women’s) usually comes to mind when referring to Old Dominion (2017 SUR 5-7; PSR 4-8; O/U 6-6), the Monarchs are slowly but surely establishing a gridiron identity under 10th-year HC Bobby Wilder, around from the beginning of a program resurrection in 2009 after a several-decade hiatus. Wilder stewarded the move up to the FBS level and Conference USA in 2014 led by decorated QB Taylor Heinicke, who would win the Walter Payton Award (FCS equivalent of the Heisman) in 2013 and continues to kick around in the NFL (this summer in the Carolina Panther camp). By the third season in C-USA, Wilder had taken ODU to a bowl win (Bahamas over Eastern Michigan) in 2016 at the end of what would be a stellar 10-3 campaign. ODU regressed, somewhat predictably, last fall, but still ended up just one win short from another bowl eligibility. Located in the middle of a Tidewater region bursting with football recruits, which was mined very effectively by Frank Beamer to help jump-start cross-state Virginia Tech in the ‘90s, there is every expectation that the Monarchs can be football-relevant in the coming years. And, let’s face it, they’re in a league that offers some opportunities. A more-experienced core returns than a year ago, with 15 starters back in the fold from the 5-7 campaign of 2017. Thrown into the fire last fall before he could legally buy cigarettes, soph QB Steven Williams now has almost a full season under his belt and is expected to improve upon his 1528 YP last season...when he was still only 17 on the day he drew his first starting assignment vs. North Carolina on September 16. By the end of the campaign some of the rough edges had been smoothed and Williams didn’t commit a TO in his last four starts. A year older and having matured physically, Williams could emerge as the same sort of threat that David Washington did when leading ODU to the Bahamas Bowl two years ago. He’ll have one of C-USA’s top runners in sr. Jeremy Cox, who has gained almost 1400 YR over the past two seasons and ready to fill the shoes of the departed Ray Lawry, who gained over 4000 YR in his Monarch career. The receiving corps figures to benefit from a more-mature Williams and the return of sr. WR Jonathan Duhart, who has 109 career catches but missed most of 2017 with injuries. The OL is seasoned with four starters back in the fold, so it is reasonable to expect some improvement in the very modest (that’s being kind; how about subpar?) 20.7 ppg from a year ago. The “D” also slipped in 2017 but now returns with a mostly-upperclass look and the potential to wreak havoc with what might be one of C-USA’s best pass rushes. Senior DE Oshane Ximenes is an All-C-USA performer who recorded a school-record 8.5 sacks last fall, while fellow DEs Daniel Appouh and Tim Ward combined for 6.5 sacks. The top two tacklers from last season, LBs Marvin Branch and Jordan Young, also return, though rush “D” was a bit leaky in 2017 (ranking 105th). The secondary also loomed as a question mark out of spring, as d.c. Rich Nagy was using various combinations as he looks to replace three starters. Aside from what appears a payday trip across the Commonwealth to Virginia Tech on September 22, the rest of the non-conference portion of the slate (Liberty, faltering ECU, & VMI) looks like it can provide some wins, and there are always possibilities within C-USA. Last season, with a very-young Williams taking most of the snaps, the offense was not up to outscoring many foes. This year, with the QB now of voting age, ODU’s offense might be able to carry a bit more of the load, and squeezing into a bowl is a reasonable expectation. Spread-wise, Wilder had emerged as a bit of a force in the bowl year, and entered last fall on an 11-5-1 spread run; without a lot of offense, the Monarchs covered only four times in 2017. Curiously, Wilder offered much better value as chalk than as a dog in the bowl season two years ago, and enters this fall only 5-14 getting points the past three seasons. Perhaps Butch Davis can give Jim Rice a call, because the former Red Sox slugger knows what it feels like to have a great debut overshadowed. In the case of Rice, it was teammate and fellow rookie Fred Lynn stealing most of the headlines for the memorable 1975 Boston Red Sox; for Davis, it was counterpart Lane Kiffin stealing headlines a few miles up I-95 in his debut at FAU last fall. Still, 2017 was something to celebrate for Davis and Florida International (2017 SUR 8-5; PSR 6-7; O/U 8-5), which got to the postseason for the first time since current Oregon HC Mario Cristobal took the Panthers to the St. Pete Bowl in 2011. It was also a nice bit of rehab work for Davis, who has had some real success in the past (on Jimmy Johnson’s Cowboys Super Bowl staff, winning big with the Miami Hurricanes, and also the only coach to get the new iteration of the Cleveland Browns to the playoffs) but whose last chapter at North Carolina ended a bit sour as he was pushed out under a cloud at Chapel Hill. Yet now, in what is likely Butch’s last rodeo, his rep is well on the way to being restored, even though the 28-3 Gasparilla Bowl loss to Temple is a game he’d rather forget. The thought persists around C-USA that FIU arrived a bit early a year ago, and that Davis inherited a more-full cupboard than predecessor Ron Turner (and interim Ron Cooper) knew what to do with in 2016. That has set the bar pretty high for the encore, especially as the bulk of last year’s bowl team has departed. Only 8 starters return overall, and none in the skill positions on offense, including a couple of four-year starters, QB Alex McGough and RB Alex Gardner. Still, regional insiders believe that Davis might have landed some ringers, including grad transfer QB James Morgan, who escaped the mess at Bowling Green after performing with some flair when throwing 25 TD passes over the past two seasons for the Falcons. With Gardner graduated, Davis and o.c. Rich Skrosky are hoping that sr. Napoleon Maxwell can emerge as a heavy-duty back after gaining almost 6 ypc a year ago. The receiving corps also is in need if reinforcements (perhaps Florida transfer C.J. Worton becomes a preferred target for Morgan), though four starters are back along the OL. A complete rebuild of the secondary is the main challenge on the stop end confronting Davis and his vet d.c., Brent Guy, a onetime HC at Utah State. But after the Panthers leaked badly on pass defense down the stretch, maybe new DBs are good news. Davis does believe his platoon can generate pressure up front, where Georgia Tech transfer DE Jordan Wood could make an immediate impact as well as a couple of juco DTs, Teair Tart and Tayland Humphrey. One of the DEs from last season, Fermin Silva, has been moved to an OLB spot as Davis and Guy look to goose pressure from the edge that might prove the best antidote if the pass defense is again found wanting. The schedule might also make it tough to reach last year’s 8 wins, as Big Ten Indiana (a 34-13 winner over FIU in 2016) invades Miami for the second time in three seasons, and it will be hard for the Panthers not to peek ahead at the September 22 date up the road at Hard Rock Stadium vs. the “U” and the big, bad Hurricanes. FIU also will be in revenge mode in November when hosting Kiffin’s FAU’s in the Shula Bowl. There might be enough soft spots on the slate (including UMass and Arkansas-Pine Bluff in non-league, plus the normal diet of modest C-USA opposition) to get Davis back to another bowl, though considering the mass exodus after last season, we expect the Panthers to backslide a bit this fall. Spread-wise, we might be wary of laying points with FIU, which was 0-3 in that role a year ago for Davis and has covered only 2 of its last 10 as chalk dating back to the later stages of the Ron Turner regime. Note the home-oriented slant in recent “Shula Bowl” matchups vs. nearby FAU, as the host team is 7-1 SU the last 8 meetings while also covering four in a row. We’ve seen it on occasion when a program immediately takes a dip after the departure of a special coach. Often a career assistant gets his first shot in such a scenario; we recall back to 1982, when Pitt began a steep descent under Foge Fazio immediately after Jackie Sherrill left for Texas A&M. About the same time, Notre Dame began to miss Dan Devine very badly when he retired and was replaced by Gerry Faust, fresh from Cincinnati’s Moeller High. So it was last fall at Western Kentucky (2017 SUR 6-7; PSR 3-9-1; O/U 7-6), as the Hilltoppers backed up noticeably from preceding 12 and 11-win seasons under Jeff Brohm, who moved to Purdue and immediately began to improve Boilermaker fortunes. Mike Sanford, a well-regarded offensive assistant whose dad was HC at UNLV from 2005-09, was considered a hiring coup for WKU, which returned most of its weaponry from a potent 2016 attack that led the national in yards per play (7.65). But that rank dropped to 96th nationally a year ago, one of many stats that nosedived under Sanford, all of this with prolific QB Mike White still in the fold. Perhaps Sanford was just going through his own career learning curve, but Brohm was a first-time HC, too, when he rook over a few years before, and we suspect the early handwriting might be on the wall for Sanford, whose team badly underachieved and was embarrassed by Georgia State in the Cure Bowl at the bottom of the postseason pyramid. Sanford’s response in 2018 is to call plays on offense (which he previously did as o.c. at Boise State, Stanford, and Notre Dame) as well as more hands-on work with the QBs. If this was the key, why wasn’t he doing any of it last season? He no longer has QB White, a 5th-round pick of the Cowboys; White’s former caddy Drew Eckels has scant experience and threw only 8 passes LY, but has some mobility and could provide a different dimension until touted true frosh Kevaris Thomas (from Lakeland, Fl) is deemed ready to take the controls. All-name WR Lucky Jackson (39 catches last year) could emerge as the go-to target. Sanford might also want to work on improving what was the nation’s worst rushing offense last season and hasn’t broken a run longer than 20 yards since the 2016 Boca Raton Bowl. Three starters return along the interior of the OL, but it allowed White to be sacked 48 times last season. New faces are almost everywhere else (including the playcaller) on the attack end. Once the Tops began to face some real offenses in the second half of 2017, the 4-2-5 “D” began to crack, too, with a spate of injuries also thinning the ranks down the stretch. Seven starters are back in the fold, though the hole left by key LB Joel Iyiegbuniwe, who left early for the NFL and was a 4th-round pick of the Bears in April, might be difficult to fill. The secondary seems a strength with four starters back from 2017, including promising soph S Devon Key. But d.c. Clayton White has simply got to find some pass rush pressure after WKU recorded just 12 sacks last fall. Last September, we got an early red flag that things weren’t the same as the Brohm years when Illinois whipped the Tops in the second week, and confirmed a few weeks later when barely escaping with a 15-14 win at UTEP, the only game in which the Miners came close a year ago. This year it might get ugly off of the bat for WKU with an opener at Camp Randall Stadium vs. Wisconsin. Louisville, which had been avoiding the Tops, will get to host WKU two weeks later. But this is a schedule better-suited for Brohm’s teams; Sanford will be hard-pressed to get the Tops to their sixth bowl in seven seasons, a stretch that began in the Willie Taggart era. Spread-wise, Sanford confirmed he was no Brohm a year ago when covering just 3 of 13 games (3-9-1), including just 1 of 7 away from home. All after Brohm finished his WKU career on a 20-11-1 spread uptick. Unless you’re the Vegas Golden Knights, it’s not easy being an expansion team. Especially in college football, where it usually take several years for a start-up program to gain some traction. And even then it might not be enough to save a coach; look at UTSA, which decided it had gone as far as it could under program architect Larry Coker after five seasons. Which means Brad Lambert has lasted a year longer at Charlotte (2017 SUR 1-11; PSR 6-6; O/U 6-6) than did Coker with the Roadrunners. Whether Lambert makes it to Year Seven in 2019, however, looks a bit up in the air after the 49ers badly regressed a season ago following real signs of promise in 2016. Lambert, as do most coaches under some fire, made sweeping staff changes in the offseason, but we have to wonder if that’s all that might be charging at a school where the stadium is named after benefactor but recently-deposed owner of the Carolina Panthers, Jerry Richardson. If the school bows to the sorts of outside pressures that forced Louisville to remove the Papa John ‘s name from its stadium, perhaps the 49ers can re-name their venue after still arguably their most-famous sports alum, Cedric “Cornbread” Maxwell, but that’s just our opinion. The staff changes authorized by Lambert were more of the emergency variety after last year’s offense sunk to 128th in scoring (14.2 ppg) and 124th overall, a combination exceeded in futility only by fellow C-USA member UTEP (which was winless last season). The new o.c. is familiar around these parts; Shane Montgomery was a decorated QB at NC State in the late 80s and is a onetime HC at Miami-Ohio who has spent the last eight years on the staff at Youngstown State. Another former HC, Chris Scelfo (once Tulane), is the new OL coach. After running an ineffective spread last season, Montgomery installed a pro-style attack in the spring, which appears an odd fit for holdover sr. QB Hassan Klugh, a “spread baby” if there ever was one. Don’t be surprised if Miami-Fla. grad transfer Evan Shirreffs ends up in the cockpit. An experienced OL does return four starters, and jr. RB Benny LeMay (732 YR LY) ran with a bit of flair last fall, though some new faces are being counted upon to emerge at WR. Remember, this was one of the nation’s worst offenses last season, so all of the returning starters (8) might be more curse than blessing for Montgomery and Lambert. The kicking game must also improve after resembling the 1950s a year ago when Charlotte PKs converted just 4 of 13 FG tries. The “D” was nothing to write home about last season, either, ranking 103rd in scoring and 111th overall, so Lambert changed coordinators on the stop end, too, enlisting former Oklahoma State aide Glenn Spencer, who began to install his 4-3 looks in spring. A whopping ten starters return, but few playmakers other than DEs Zach Duncan and Tyriq Harris are in the fold. It is hoped that sr. Juwan Foggle, in his second year at LB after previously a WR, will continue to progress. One stat that has to improve is the number of interceptions from last season...2, hard to believe in a wing-it league like C-USA. Various jucos and true frosh will have chances to contribute. After being napalmed by Louisville and Kansas State (allowing a combined 125 points!) when stepping up in non-league the past two years, the 49ers don’t dare schedule more than one Power 5 foe (this year it’s at Tennessee, but not until early November). Charlotte should be able to exceed last year’s paltry one win, but how many Lambert might need to stay out of hot water remains to be seen. Spread-wise, it’s worth noting that there have been plenty of worse performers vs. the line over the past two years than the 49ers, who actually enter this season having covered 10 of their last 19, including 6 of their last 8 a year ago. Before getting too carried away, however, remember this was a side bad enough to get blanked by both Georgia State and Old Dominion last season, a hard-to-achieve negative parlay. Proceed carefully!